Description: With privacy assured, nestled amidst rolling lush paddocks you will find this absolutely charming homestead named "The Old Glenreagh Station" on 98 acres (40ha approx.) with stunning Orara River frontage. The home offers 3 bedrooms, 1 bathroom, featuring soaring 12' ceilings, the warmth of timber floors and romantic French doors that lead to shady bull nose verandas. The kitchen is the heart of this special home boasting a character Falcon oven which has 5 gas burners, 1 wok size, bar-b-que grill and 2 electric ovens. Loads of pantry space and room for a large double fridge. The separate lounge room is air-conditioned and separate dining has bi-fold windows to let the outside in. The sunny bathroom features a deep claw bath which also enjoys bi-fold windows to open widely to take in the rolling country side. The 3 bedrooms are all generous in size and have pretty French doors to catch the cool summer breeze. Add to the list a separate studio with powder room (w.c. and wash basin) and a self contained flat with double garage attached, 3 bay farm/machinery shed, dairy and green house. The 98 acres (40ha approx.) is partly cleared and partly treed with a paddock of 200 mature Pecan trees and a plentiful orchard. The pristine Orara River frontage gives a fantastic fishing opportunity and a wonderful spot to swim on those warm summer days. 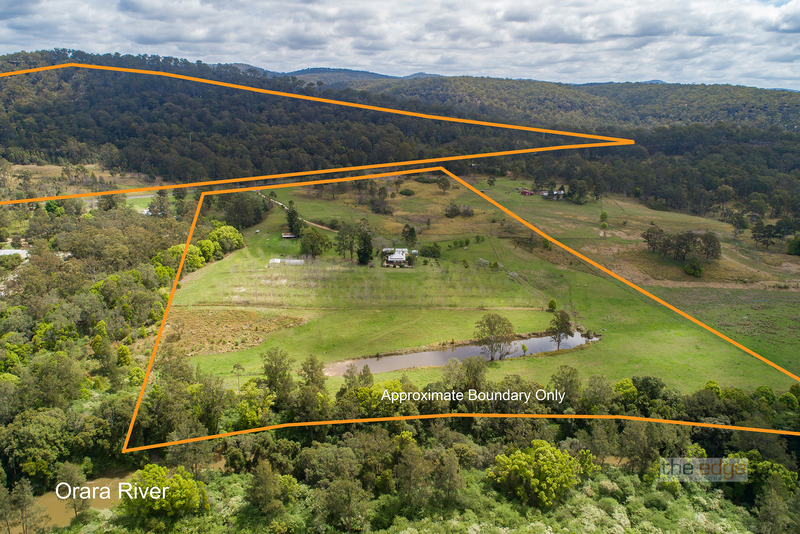 There is no water shortage on this property with a large billabong, bore and additional dams. Located just minutes to the friendly country village of Glenreagh offering the convenience of a general store, fuel station, café, bakery, post office, primary school, public pool, tennis courts and a family hotel. The property is also centrally located between Coffs Harbour only 43 mins (aprpox) and Grafton 34 mins (approx.). Don't hesitate, call now as rural property of this calibre are a rare find! Contact The Edge Coffs Harbour Today!!! Email The Edge Coffs Harbour Now!